Personalized 9x12 Rustic Cabin Sign for the Hunter or Angler - - or Nature Lover with your choice of a walleye fish, loon, majestic moose, or stag in the center. Wood-tone and trimmed in black with the design printed directly onto the composite wood base. The walleye sign will delight any fishing fan. 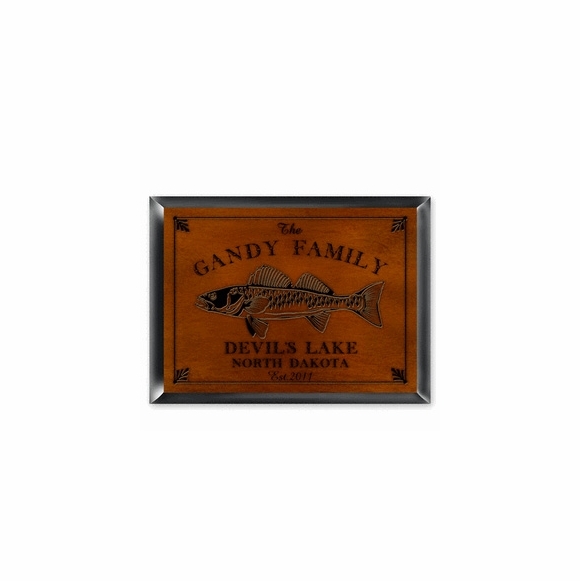 Ideal for a fishing cabin, ice house, or lakeside retreat. The loon sign is perfect for everyone who enjoys lazy days on the lake. Hang the stag sign to mark the spot where hunting is always perfect. And the majestic moose sign is sure to please nature lovers of all ages. Personalized with your name, location, and established date. Name and location lines hold up to 20 characters. Images: walleye fish, loon, stag, moose.